From 1985 FLEXIM is a ready-to-use, permanently elastic roof mortar. An important component is the natural product linseed oil, used for centuries in building construction. 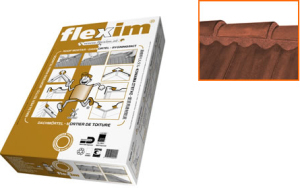 FLEXIM contains no asbestos, or any other harmful substance and due to an addition of lightweight polystyrene (CFC-free) is extremely easy to handle on roofs. When carrying out renovation work, first remove any loose pieces of cement mortar. 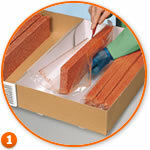 Ensure a dry, dust- and grease-free substrate. Do not use during persistent rain. The adhesion surface must be at least 2 inch/5 cm. 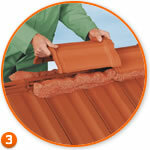 It is advisable to use additional fastenings for fastening hip tiles and side wall tiles. 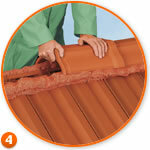 When using additional fastening, ensure adequate space for movement of the roof. Do not rigidly fasten the ridge on the ridge beam. Finish off the surface smoothly. Cut off any surplus material, measured from the roof surface at an angle of 90°. 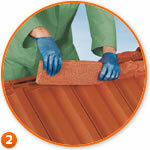 Immediately after use, clean the hands, tools and any contamination on the tiles with a dry cloth. Ventilation can be achieved by using ventilation tiles. FLEXIM roof mortar has been comprehensively tested by independent testing organisations. Uncompromising adhesion- and tension-related, but most importantly, ageing tests were unleashed on most commonly encountered types of tile. 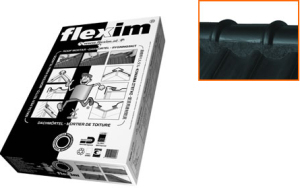 These tests showed that FLEXIM brilliantly withstood even the most extreme weather conditions! The test report establishes that the tensile strength of FLEXIM roof mortar is 20.000 N/m², which meets the requirements of NEN 6707. 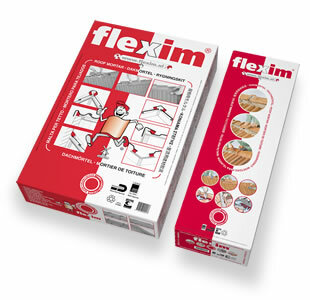 The products of Flexim International B.V. comply fully with the requirements as set out in Construction Product Directive 89/106/EEC. According to Article 66 (1) of the Construction Product Regulation 305/2011/EU, products that have been placed on the market in accordance with Directive 89/106/EEC before 1 July 2013 shall be deemed to comply with the Construction Product Regulation. Flexim International B.V. products are affixed with a CE mark on the basis of an EC Declaration of Conformity. 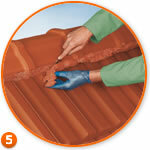 FLEXIM roof mortar also holds the USA Miami Dade certificate. 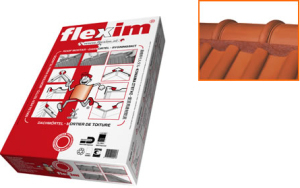 On being tested at wind speeds of 178 km/h, the flexibility of FLEXIM ensured that roof tiles remained in place even under extreme conditions. In 2010 FLEXIM also had its product tested by the British Board of Agrément (BBA) to ensure that it met exacting British standards. In developing the FLEXIM storm-proof roof mortar product the use of asbestos and CFC’s was avoided on environmental grounds, being one of many reasons why FLEXIM received the Innovation Award and representing a breakthrough on the national building construction market!